MOSCOW, August 30. /TASS/. Moscow Mayor Sergei Sobyanin took part in the opening ceremony of a new 14-kilometer long section of the Moscow metro’s Kalininskaya-Solnechnaya line, including seven new stations. This is the longest section of the Moscow underground opened in one go. The new extension of the subway line includes the Michurinsky Prospekt, Ozernaya, Govorovo, Solntsevo, Borovskoye shosse, Novoperedelkino, and Rasskazovka metro stations. The mayor was present at the opening ceremony near the Rasskazovka stop, along with Muscovites. Prior to that, he opened the Solntsevo train depot, which is going to service the new line. This is the longest extension ever opened in the history of the Moscow metro, and the first time since 1983 when seven stations have been simultaneously opened. 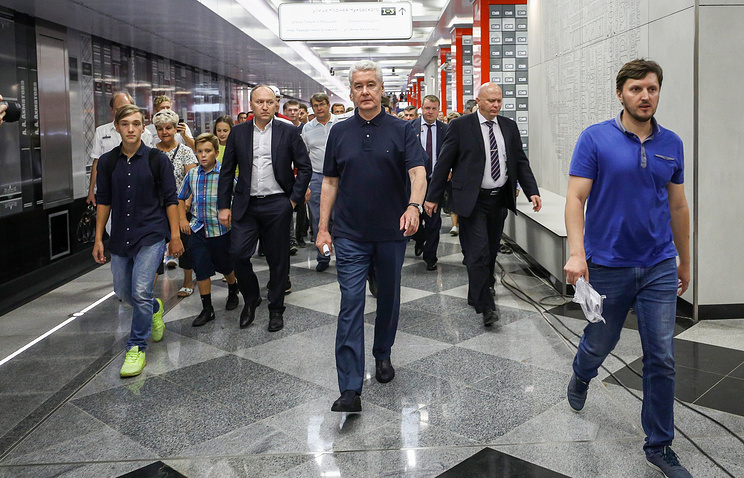 "A huge section of the metro is opened - 30 kilometers from Park Pobedy and Petrovsky Park [stations] to Rasskazovka," Sobyanin said, thanking the construction workers. According to him, many people living in these neighboring districts have waited nearly half a century for the metro to reach those areas. Currently, the Moscow metro has 222 stations, not including the Moscow Central Circle, with the lines stretching over some 380 kilometers. The new stations will service around 600,000 Moscow residents, and on average, it will take riders from neighboring districts around 45 minutes less to get to the city center. In the future, the line will reach Vnukovo Airport, and it will be connected to the city center via the now functioning section of the Kalininskaya line from Tretyakovskaya to Novokosino stations. So far, the trains go from the Rasskazovka station to the Petrovsky Park station of the Large Circle line.